The most heartening aspect of Agrotech today was the presence of over 250 agriculturists from the Sangrur belt where a number of farmers had committed suicide due to debts. Though poverty-stricken, many farmers from the area made it to the fair. The National Egg Coordination Committee did all it could to hog the attention of farmers and other visitors today. HMT Limited, Pinjore, hopes to get back on rails as it diversifies into manufacturing Trantors — India's first transport oriented 25 HP tractor, and jeeps, from next year. Scores of car owners in the city have allegedly been taken for a ride by the management of High Speed Solutions, a 24-hour car helpline. With the company closing its operations in the city, the car owners, who enrolled as members of the helpline by depositing Rs 450 each, have been left to fend for themselves. The busy Chandigarh-Ambala highway that had been closed since Tuesday night following repair of the Ghaggar river bridge at Bhankharpur village, will be opened for heavy vehicular traffic on Monday evening. A woman labourer had a miraculous escape today, after she fell from the fourth floor in the Deputy Commissioner’s office. Kamlesh (25) of Shastri Nagar in Mani Majra accidentally fell from the terrace of the building, while dumping debris. A 10-year-old boy was crushed to death by a truck on the Zirakpur-Panchkula road near Yadavindra bridge here, this morning. According to the police, Amit Maurya, son of a migrant labourer Prem Shankar, was crossing the road when the truck (HR-68-7786) heading towards Mohali crushed him. The boy died on the spot. A group of certain Jeep-borne youth assaulted a senior lab technician of the Government Medical College and Hospital, Sector 32, while he was coming out of the hospital this afternoon. He was admitted to the hospital with serious injuries. President of the Chandigarh Territorial Youth Congress, H.S. Lucky today, dissolved the state executive committee and all cells of the CTYC. While District office-bearers and ward presidents were removed, three district presidents have been retained. The Defence Ministry has accorded sanction for creating 500 additional vacancies at the level of full Colonel in the Army, it is learnt. Growing popularity of music and proliferation of MP3 formats has made the Indian music market more vulnerable to piracy than ever before. Certain discrepancies in promotion policies governing the military cadre vis-a-vis their civilian cadre in the Military Engineer Services have come to light, with several affected personnel forwarding a representation in this regard to the Defence Ministry. Chandigarh is heading towards becoming the first city of the world for the cyclist to wear helmets. The city traffic police seems to be catching on with the United States of America where an effort in this direction has begun just this year. Ms Jer Master, member, Christian Science Board of Lecturership, Boston, USA, conducted an interactive session on “What decides your future?” for general public at the auditorium of Government Museum and Art Gallery, Sector 10, Chandigarh today. The management of production, distribution and marketing processes through which a consumer is supplied with a product was highlighted at a conference on “Building a Robust Food Supply Chain” at the CII here today. The names of martyrs from Punjab, both in the Defence and paramilitary forces, should be included in the obituary references as they had sacrificed their lives defending the nation and the House must pay homage to them. As many as 300 blankets and woollen garments were distributed by UT Administrator S.F. Rodrigues’ wife, Jean Rodrigues among the poor people of the Colonies No 4 and 5 and Janta Colony at a function organised by the UT Red Cross Society here today. The Model Jail Burail is all set to get three sniffer dogs to keep a tab on the supply of drugs and explosives in the jail premises. A dog training centre in Sector 20-A has been given the order to supply the two male and one female pup of Labrador breed, after the Jail Superintendent selected the pups at an inspection recently. The Chief Minister, Mr Om Prakash Chautala, today laid the foundation stone of the Haryana Tourism’s corporate office in Sector 2 here. The offices of the Tourism Department, Tourism Corporation and the Hospitality Department would be housed in this new building. Scared of monkeys, a 22-year-old man jumped from the first floor of a building in Sector 26 and fractured his leg this morning. Mr Ravinder Singh, a resident of Shahpur Colony in Sector 38, went to clean a water tank at the top of the Orion Company office, where he works as a peon. Did the local police nab one of the suspects in the Balongi cheating case today? It is learnt that Major Singh, owner of the house where a business by the name of Jai Lakhmi Super Agency was being run, is in police custody, though this has not been confirmed by police officials. A house was burgled in Sector 26, the local police said here today. Mr J.R. Dayal of Sector 7-B filed a complaint that some gold and silver ornaments and cash Rs 50000 was stolen from his residence during daytime, yesterday. Panjab University decided to issue roll numbers to students of the Sociology Department, Panjab University, facing lecture-shortage, for the on-going semester examinations in the Department. The decision was taken by a committee meeting chaired by the Dean University Instruction, Prof J.K. Gupta, after the department’s Board of Control met, here today. It could take some more days before the name of the Director of the PEC deemed university is finalised. The five-member search committee, constituted by the Union Ministry of Human Resource Development to finalise the name of the candidate for the post of director, today met at Delhi. A seminar and discussion on “Challenges of Human Resource Development in Education and Training Sector in India” was organised at Panjab University by Education and Careers Applied Research Establishment (EduCARE - India), an NGO. Differences have surfaced between two groups of the Punjab and Chandigarh College Teachers’ Union (PCCTU) over courting arrest at Chandigarh on December 7, to press for the release of grant-in-aid. In the two-day State-Level Children’s Science Congress which concluded at ST Kabir Public School, Sector 26, today a model of Sacred Heart Senior Secondary School on rain water harvesting and a model of Carmel Convent School, Sector 9, on people’s perception about the aspects of water were adjudged first and second, respectively, in the junior category. A two-day academic seminar for students of Delhi Public School, Pinjore, and an orientation programme for the teachers concluded today. The seminar was conducted by Mrs Vinita Kher, Director, Education Management Centre — DPS Society. Tiny Tots’ Foundation School, Phase X, gave a festive look on the occasion of the 21st annual day celebrations here today. 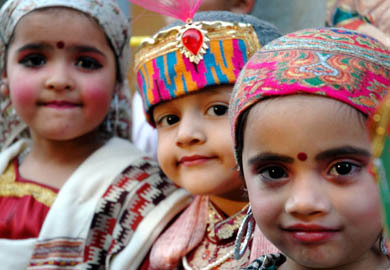 Nearly 100 children, between the age group of two and a half years and five and half years, took part in various items presented at the show. 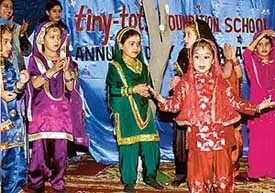 Students of Tiny Tots’ Foundation School, Phase X, Mohali, perform during the annual function of the school on Saturday. Panjab University has received a communication from the office of the Vice-President of India and Chancellor, Panjab University, Mr Bhairon Singh Shekhawat, that the names of Fellows elected and nominated to the Senate had been notified. The Rayat Educational and Research Trust will set up an institute in Kharar offering engineering-level biotechnology courses. According to a press note issued by the trust here today, the trust had already acquired 40 acres for the purpose of setting up the institute. Election to the District Bar Association executive committee will be held on January 21, 2005. 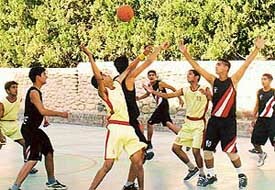 This decision was taken at the General Body meeting of the Association here today. A partition plot dealt with fineness and simplicity, ‘khamosh pani’ flows like the never-ending pain of Hindu and Sikh women who were left behind in Pakistan following the riots and are still living there, hiding their true identity. As the camera very candidly captures the poignancy, filmi sentiments take a backseat. What emerges is a panorama presented in an extremely fresh perspective with Excellent cinematography. 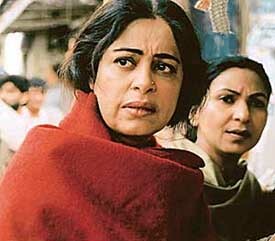 Kiron Kher in “Khamosh Pani”. The Saanjhey Ranng Punjab De today held celebrations over the honour of ‘Shiromani Raagi of 2003’ bestowed upon Baba Ghulam Mohammad Chaand Rabaabi of Lahore by the Language Department of Punjab at Patiala yesterday. It was memorable moment for city-based Nitasha Bhateja when she was crowned Googly Woogly Queen-2004 at a function held in Delhi. She was crowned by Miss Femina India Universe Tanushree Dutta and Femina India Miss Earth Jyoti Brahmin. Nitasha was awarded a cash prize worth Rs 1 lakh and some sarees designed by Ritu Kumar. at a function in Delhi. 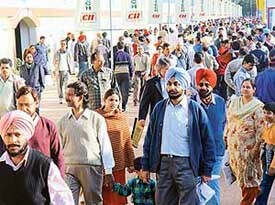 International Day for the Disabled was observed by the Society for the Care of Blind, Sector 26 on Friday by organising an eye check-up and screening camp at the Government High School Sector 26 in collaboration with the PGI, General Hospital, Sector 16 and GMCH Sector 32 and ophthalmology society of Chandigarh. The Government Medical College and Hospital, Sector 32, will tie up with private diagnostic centres of the city and its periphery to provide the MRI facility to patients. Two new cases of leprosy were detected and given free medicines at the leprosy detection camps organised at three sites in Kumhar Colony and Janta Colony, Sector 25 by the District Leprosy Society, Health Department, UT today. Holding of the first ever India-Pakistan Punjab (East and West Punjab) games beginning tomorrow at Patiala will usher a new era of peace and brotherhood in these two states. Guru Gobind Singh College for Women, Sector 26, and DAV College, Sector 10, Chandigarh, were winners in the Panjab University Inter-College Athletics meet in the women’s and men’s section, respectively, which concluded this evening on the PU campus. Getting tough with the provident fund (PF) defaulters, the Office of the Regional Provident Fund Commissioner has attached the bank accounts and movable and immovable properties of three industrial units in the city and adjoining areas.